Local hip-hop artist M-Phases has created a big name for himself working with not only a plethora of immensely talented Australian artists but also American legends including Pharoahe Monch, Madonna and Eminem so when he brings out an artist you take heed. It is quite apparent that he has worked hard on Ruel who is now signed to RCA Records. In April 2017, Ruel released his debut single Golden Years with M-Phazes and it has been all positive since then. I didn’t know what to expect from this young Sydney-sider but was incredibly impressed with his effort on Friday, 28th at The Corner Hotel where he was joined by KIAN and Dylan Joel. KIAN, a Melbourne based singer/songwriter took to the stage first showcasing his unique voice. Having recently won the Triple J Unearthed competition, the artist did look a little nervous but I am sure we will be seeing more from this guy. Dylan Joel followed with his blend of acoustic guitar, drums and occasional double-time rap stylings. 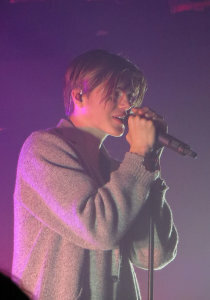 Joel confidently performed several songs along with his Triple J Like a Version cover of You Got A Friend In Me and two new tracks. With a pretty full house (many being screaming young ladies) Ruel took to the stage at around 10.30pm opening with the euphoric hit Golden Years. Dazed & Confused quickly provided the crowd with a jolt of energy thanks in part to Ruel’s energetic and free-flowing steps. A more gentle moment was Ruel’s piano-laced ode to a fallen friend due to suicide. It was a sobering contrast to the more light-hearted subject matter and showed a real sense of the artist’s maturity. During his set Ruel was joined on stage by Dylan Joel where they performed Think About You. But the stage belonged to Ruel where he went on to perform several tracks off his latest EP titled Ready complete with his Like a Version accoustic guitar cover of Belly Ache. Ruel’s show was quite something as not only the content inpressed but also the artist’s poise and emotional edge is far beyond his 15-years.